Sometimes a protest is just a riot camouflaged in self-righteousness. It might not start that way, and the actors might not think that it is. But nonetheless, sometimes it is. A few miles from my apartment, the Miami neighborhood Liberty City has yet to shake the aftereffects of the 1980 riots that sprang from the acquittal of four officers in the killing of a black man. In California, neighborhoods and property values remain scarred from the Watts Riots in 1965 and the Rodney King Riots in 1992. More recently in Ferguson, Mo., the long-term consequences of a few nights of looting and burning are starting to be felt by residents and property owners. So it makes sense, in a way, that facing a weekend of protests against the mysterious police-related death of resident Freddie Gray, that Baltimore authorities would be on edge. Overall, Baltimore police said 34 arrests were made during Saturday’s main demonstration, and six officers were allegedly injured. Several downtown storefronts were smashed, and some police cars were damaged. But overall, the most of the damage was cosmetic, and it might not cost the city or property owners a fortune to fix. Either that, or it might have been worth the calculation from city officials to sacrifice a little public property for the sake of allowing protesters to vent their anger, hopefully quelling unrest in the long run. This weekend’s protests garnered international attention, drawing comments from everyone from Iran’s Ayatolla Seyed Ali Khamenei, to Baltimore Orioles players, who basically were trapped with fans inside of the stadium on Saturday night due to the protests that were going on just outside, as a win against the Red Sox came to a close. Despite her comments about creating a “space” for more destructive elements in protests, Mayor Rawlings-Blake expressed disappointment on Sunday night at the “outside forces” who she said were “inciting some of the ‘shut this city down’ sort of messaging,” according to the Baltimore Sun. Then, she made a call for peace, which might not be too far away. Gray will be buried on Monday, and the Baltimore Police Department’s full report on Gray’s death should be released before next weekend. 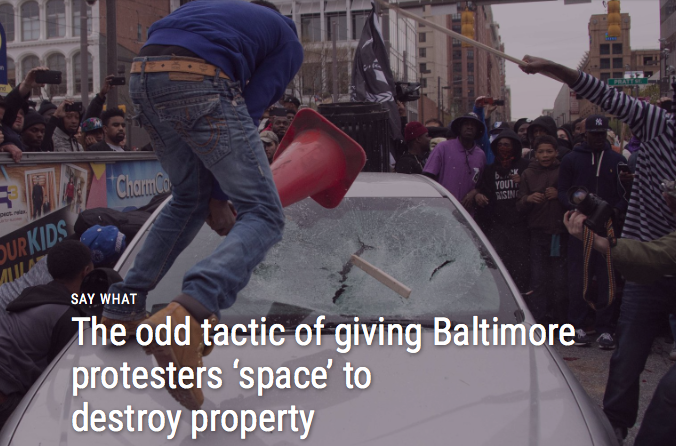 It could be very well that protests in Baltimore have already reached their peak of violence and destruction. Considering how volatile the situation looked going into last weekend, if it all pans out, there could be a case for other leaders to handle widespread protests like this differently. Because sometimes, punching the punching bag really does take your anger away. And on the flip side, telling you not to punch the punching bag can only make you angrier.